I simply love crossbows and the accessories that come with shooting them. The questions of picking out the right bolts and broadheads for your particular crossbow are questions I get frequently on my YouTube channel and this article will dive into this world of archery accessories. There are three basic types of broadheads available to archers these days: fixed blade, mechanical or a hybrid of the two. Some will argue that a fixed blade broadheads are superior to mechanicals as they have no moving parts and, like a revolver versus a semi-auto pistol in the handgun realm. The issue with fixed blades, however, is that they are inherently not as accurate as a mechanical broadheads, as a general rule, and this potential inaccuracy can be amplified at longer ranges. There are some fixed blades that fly like field tips but the drawback many times is the cut radius. On the other hand, mechanicals typically fly like field tips and the closed blades expand or deploy upon impact with the target. The drawback here is that some or all of the blades can potentially not fully open when the moment of truth comes. If you have bowhunted for many years like I have and used a wide variety of mechanicals, this has most likely happened to you. The design and build of mechanicals from various manufactures differs immensely and its important to shop for the best quality and overall value for your next hunt. For the best of both worlds, there are hybrid broadhead, a mix of fixed blade features with mechanical deployment upon impact. This is a nice combination of two effective technologies, a 1-2 punch if you will. This technology is newer than the other two and has been well received in the archery market for the most part. I am more of a fan of a mechanical and personally prefer the Grim Reaper crossbow broadheads in 1 ½” cut radius. I have killed dozens and dozens of animals on and off camera with these broadheads and, in the 7 years I have shot them out of my crossbows and hit vitals, I have never lost an animal or had any of the three blades not deploy and do their job on contact. I have recommended this brand to other new bowhunters and my friends and family have had similar experiences. For fixed blade heads, there is the Grim Reaper Hades. These are also hard to beat in my humble experience. What sold me on Grim Reapers aside from their performance was the ease in rebuilding a broadhead after a kill. In some cases, I have rebuilt a broadhead 3-4 times before replacing it. That is pretty economical. Regardless of what brand you choose, a good rule to keep in mind, is to pay a premium for your broadheads. This is not a place you want to save money. Here the “bullets are real” as we say in the firearms world. It really counts. Spend the money and buy a quality brand, not from the big box discount store clearance rack. For crossbow bolts, it is vitally important you follow the manufacturers recommended bolt length and weight and shoot crossbow rated broadheads. The main reason you don’t want to shoot a bolt too short or too light is that many times it can be just like dry firing your crossbow, which can destroy many crossbows in a hurry. While you don’t have to be restricted to the bolts that come with your crossbow or the ones the manufacturer makes, following the owner’s manual recommendation is crucial. 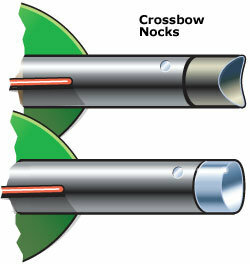 Also, be aware of what kind of nock your crossbow requires. There are two types: half-moon nock and flat nock. Be sure to select the right one when purchasing new or even used bolts. The quality and price rule we discussed earlier for broadheads can also be followed for bolts. Expect to pay for quality and, again, don’t shop off the clearance rack. Your broadhead and bolt are your one and only connection to the game you are hunting. The value of crossbow bolts come in their durability as you should be able to use them over and over again aside from the exception of damaging them on a hard impact or losing them in the woods. I personally like Gold Tip Laser III bolts and have shot these in my crossbows for many years. They are among the most durable crossbow bolts I have shot as well and are simply as tough as nails. One final note on broadheads. When I first started in my bowhunting pursuits many veteran bowhunters told me that mechanical broadheads weren’t suited for tough game like gnarly wild boars, buffalo and other large game animals. As long as your crossbow has enough power, and most modern brand name hunting crossbows do, mechanicals should work fine. I have taken some great animals over the years with mechanicals. Why should I choose an Excalibur crossbow?